Klagenfurt, the small lakeside city at the heart of Carinthia (locally Kärnten) in southern Austria, is easily reached from London by Ryan Air's low price direct flights, and it hosts one of Europe's newest International Festivals. There are several particular reasons for British cultural tourists to consider Wörthersee Classics Festival, promoted by the Austrian Mahler Society (President, Elena Denisova) in early June. The festival's musical identity, which will provide a thread of continuity, at least for the early years, is that five of the very greatest composers happened to have a close association with the area. For 2003 Prokofiev, on the 50th anniversary of his death, was also featured, and Russian musicians, some of them previously ecountered in Antwerp, were prominent in the roster of performing artists. Mahler told Sibelius that, for him, the Symphony contains the whole world. For Gilbert Kaplan, musical monomaniac extraordinaire, this one symphony contains his whole musical world. At first an amateur, self-financing conductor, he met a sceptical critical response when he embarked on his love affair with Mahler II more than two decades ago. The Vice-President of the Kaplan Foundation told me that he had now conducted it with some fifty-five different orchestras, and Gilbert Kaplan himself confirmed to me that he has no plan to conduct any different music. I had not attended any of Gilbert Kaplan's performances, and he was perplexed that I had come to Klagenfurt to do so, since he had taken his interpretation to Manchester a few weeks ago, and was bringing it to London in the autumn. Kaplan's Conifer recording with the LSO won plaudits and his re-recording of Mahler II, with the Vienna Philharmonic Orchestra, is to be released in conjunction with that next London appearance. This opening event of the second Wörthersee Classics Festival, which had begun modestly in 2002, was special in several ways. The vast Wörtherseehalle 7, normally used for trade exhibitions etc, was specially provided with a platform and reflectors designed by Manfred Bockelmann for the festival, under the supervision of acoustician Dr Karl Bernd Quiring, turning an unpromising commercial venue into an attractive and acoustically ideal space for the audience of a thousand which filled it - so important an event has Wörthersee Classics quickly become in the Carinthian cultural calendar. And Kaplan, with a now vast accumulated knowledge of his chosen subject, was blessed there with ideal and rare conditions - a great orchestra with which he had been allowed five four-hour rehearsal sessions in Moscow, before they flew to Klagenfurt the previous evening. Normally he only gets two three-hour rehearsals. The reward was self-evident, a perfectly honed account by the Moscow Philharmonic Orchestra, which had not previously played the work for very many years, nor was scheduled to give it back at home after this single, thoroughly prepared performance. A great surprise to me was seeing Gilbert Kaplan the conductor; very professional, in the manner of Boult, which is in my book high praise. He takes a long view, underpinned by strong pulse, bringing the listener with him around all the bends and corners of Mahler's long journey. His beat is clear and authoritative, the left hand independent and expressive for moulding dynamics, the arm dropping to his side when he has nothing to say with it. Kaplan's approach is analytic, a litle cool, alert to every moment, attentive to contrapuntal exchanges between whole sections, a master of interior orchestral balance. And, crucially, no imposition of heightened emotion to impress upon us that it was 'his' Mahler II. Fine solo singers Michaela Kaune & Manuela Bress and choirs from nearby Slovenia, their professional Chamber Choir strengthened by the Consortium Musicum Choir formed for collaboration in orchestral works,ensured a rousing finale, marred only by an electronic organ which went berserk and engulfed everyone else in the very last pages. The well-known Mahler connection with the area was enhanced by a (rather long) climb, following Mahler's own early morning route from his lakeside base at Mairnigg up to the small, bare composing house in the woods (the cook had to take a different, steeper route to deliver his breakfast so that he would not be distracted by seeing her!). Here, where many of his symphonies were written, we found a small museum and extensive Mahler library cared for by Pierre Velik, knowledgeable devotee, who played us tracks from rare piano recordings by the composer. The sadnesses of Berg's later life was underlined by a specially arranged visit to the Berg House overlooking Wörthersee where Alban Berg worked on the violin concerto and Lulu (not open to the public; publication of photos of the many memorabilia was forbidden by the Berg Foundation). 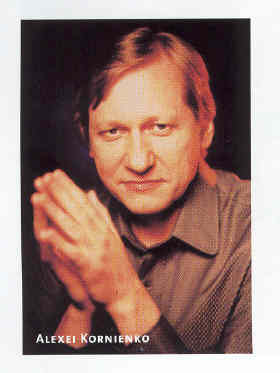 On Klagenfurt's Alban Berg Day, the Moscow Philharmonic under Peter Keuschnig preceded the concerto with a festival commission, Small Fantasy for Large Orchestra by Nikolaus Fheodoroff, before supporting violinist Elena Denisova representing Manon Gropius, whose untimely death had inspired the work; Berg himself was not fated to live to hear its premiere. The Moscow Philharmonic's contribution ended with a roof-raising account of one of their national war-horses, an always effective Romeo & Juliet Suite by Prokofiev. Hugo Wolf and Prokofiev featured in one of the festival's unique events, sponsored by Machold Rare Violins, in which Elena Denisova appeared again to great advantage. It began with a sparkling, fully idiomatic performance of Hugo Wolf's Italian Serenade by Anima Quartet, a young group formed in Carinthia which, on this brief reckoning, shows every prospect of a disti nguished future in a highly competitive field. Prof. Dietmar Machold, a famed expert in restoring rare violins, discussed the instruments and working methods of Stradivarius, Guarnarius and other classic violin makers before Elena Denisova and Norwegian violinist Atle Sponberg shared a performance of the Bach solo Partita in E, alternating the movements, she on a Strad, he on a Guarnerius, both lent a few days beforehand from Machold's collection. No contest nor any conclusion possible! Both sounded magnificent, and the two virtuosi rounded off the morning with a compelling account of a Prokofiev rarity, the sonata for two violins Op 56. Wolf's formative years were tied to the Carinthian region, with its repeatedly changing boundaries. He was born in a house which is now a music school in Slovenia, just over the border (I wonder whether and how they celebrate their association with so famous a former resident?). 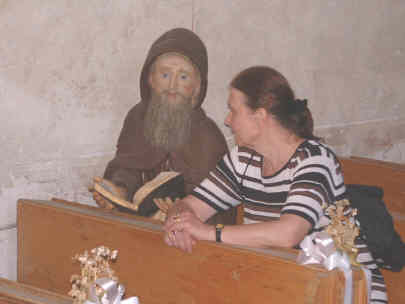 During a difficult, traumatised childhood, he was placed with Benedictine monks in the area, where his musical potential was fostered and flourished. But he was twice expelled for misbehaviour during his schooldays and personality difficulties persisted into adult life, succeeded ultimately by syphilitic mental breakdown. An undoubted highlight of the festival was one of relatively few Wolf recitals in Austria during this centenary year of the great song composer's death. We learnt that lieder recitals attract only small audiences in Vienna, and that Wolf is not at all popular there. Writing in the progamme book, Dutch composer Jo Sporck attributes his belief that Wolf's centenary 'will only be given its proper due by few people' to his failure to produce an orchestral 'visiting card'. Ildikó Raimondi gave her selection in the original keys, and told me that Hugo Wolf himself rejected all transpositions. In the context of the recent completion of the long running Wolf Centenary Festival at London's Wigmore Hall, which has been reviewed in these pages extensively, it is remarkable that the Klagenfurt recital by Ildikó Raimondi, famous star at Vienna Opera, with her Yorkshire-born partnerCharles Spencer, now Professor of Song Interpretation and Voice at Vienna Music University, was equal to any of the numerous centenary recitals in London, and decidedly better than several of them. They gave a well balanced programme of Mörike and Goethe settings, before ending on a quieter note with five songs from the Italian Songbook. Everything was right; tonal variety by singer and pianist responding to the minutiae of the texts, deep emotion and lightest humour by turns - holding spellbound an audience of some 500, most of whom had not known this music. No need to take my word for this duo's exceptional quality; their unique Austrian Radio CD of Lieder des Lebens aus vier jahrhundeerten is a complete winner - selections by 23 composers arranged in groups of Childhood Scenes; Pains & Pleasures of Love; Ideals, Dreams & Reality; Saying Goodbye (ORF CD 304 - order from mailto:orfshop@orf.at)*. The Brahms day brought Sabine Meyer (popular clarinettist famous for breaking the BPO's gender barrier!) and Misha Maisky with pianist Pavel Gililov. They joined forces for the clarinet trio after Sabine Meyer gave the F minor sonata and Misha Maisky the infrequently played, and very welcome, cello version in D major of the violin sonata Op 78 in G, which was composed at Wörthersee. But there was no chemistry in this trio nor magic in the duo interactions, so I was driven back to the recording by Czech-born cellist Michaela Fukacova, who I first heard (and never since) at a Scandinavian Festival in London many years ago. She includes it in a recommended Brahms 3-sonata recital recorded at Denmarks Radio (Kontrapunct 32027) with her compatriot Ivan Klansky, a frequent visitor to UK with the Guarneri Trio Prague, a group I never miss. Webern, who spent his early formative years at Klagenfurt, was rather an odd man out in the festival scheme, sharing the programm e with Mozart on the designated Webern Day. The note by composer Anthony Girard, 'not an unconditional admirer of Webern', seemed designed to both identify with and assuage resistance to this 'difficult' composer. Despite the distinguished musicologist Dr Wilhelm Sinkowicz's efforts to enthuse us, Webern's symphony proved a bitter pill for the local audience and during its 11 minutes duration was accompanied by mutterings of disapproval. Nor would many converts have been made by the early piano quintet - Webern's teacher Schonberg did not like it; nor did I. 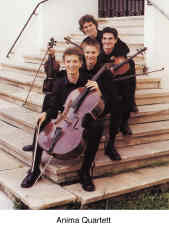 They were entrusted to I Virtuosi Italiani (Modena) under the supervision of the festival's Artistic Director, conductor/pianist Alexei Kornienko, a contemporary music specialist. This last concert was completed with Mozart's Piano Concerto in A K414, in the version with strings, and an alert, sparkling account of Symphony No 29 to bring the whole festival to a happy conclusion. Ryanair has opened up a beautiful and fascinating area with cultural roots stretching back to pre-roman times. Evidence of Carinthia's long history abounds everywhere in settlements, castles and churches throughout the countryside, and in its capital Klagenfurt which is replete with well preserved Italianate and baroque style buildings. The area is ringed by mountains, yet basks in Mediterranean warmth. You can see why great composers like Mahler and Brahms found the peace and beauty of this area conducive for creative work. The initiative to establish a music festival in these propitious surroundings provides the icing on a luscious cake. The success of this venture in this its 2nd year, attests to its acceptance by a music-loving local population. Given its ambitious and high artistic standards, and its advantageous location in beautiful surroundings, it should also attract visitors from further afield. Indeed, it is no more difficult for music lovers, probably no more expensive and considerably less hectic to visit the Wörthersee Classics Festival than to venture North within the UK from the South East of England to the popular Edinburgh Festival. We stayed very comfortably in the characterful old castle Hotel Schloß St. Georgen B&B, only 10 minutes walking distance from Klagenfurt Airport, as is the town centre by bus the other way. The large hotel grounds are packed with mature trees and we made good use of a small swimming pool at the bottom of the orchard. 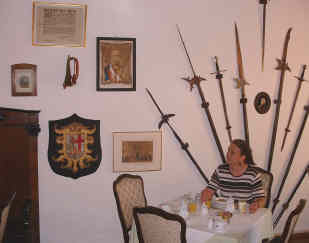 A medieval knight in full armour presides over the dining room, and in the hotel's private chapel a monk is in a permanent state of prayer (maybe he will yet save the world from all its follies)! Aircraft noise was not a problem; only a few and small planes use its runway and could not drown out vociferous cuckoos, croaking frogs, clucking chickens and the occasional mooing cow. A place we would recommend for a peaceful stay in this beautiful wooded area crisscrossed with paths for walking. Car hire would extend the possibilities for exploring further afield independently. The festival has already outgrown the town's theatre, which is also used for operas and concerts. A trade hall has been adapted with great ingenuity and expertise, under the advice of acoustician Dr. K B Quiring, to create a functional concert hall with excellent acoustics, an adaptable performance space which can be tailored to different types of music and audience numbers. Some artists may find the acoustics somewhat dry, but for the audience the clarity and warmth of tone which has been achieved is truly astonishing - a model to be studied by other communities who feel they cannot afford a new purpose-built 'proper' concert hall. A spacious covered bar area, with drinks and good quality snacks modestly priced, helps to make the audience feel welcome and comfortable. There is evidence of an enormous amount of devoted effort by very many people and a courteous, friendly atmosphere prevailed. We are grateful for the friendly hospitality we received, including the transfers back to our hotel after the concerts - buses stop very early - and wish the Wörthersee Classics Festival well. It deserves to succeed. Cork, Amsterdam, Antwerp,Strasbourg, Stuttgart, Munich, Lisbon, San Sebastian, Rhodes. http://www.musicweb-international.com/SandH/2001/Nov01/Flanders.htm " - - A generous number of CDs were presented to Seen&Heard at Antwerp - - extremely desirable, all six of them to be warmly recommended, are those involving violinist Elena Denisova and her pianist/conductor husband Alexei Kornienko, who have trawled interesting unusual repertoire and deliver well-recorded performances of superb accomplishment and attention to detail; those gifted musicians should be invited to perform in UK urgently! Denisova is a top, world class player, but her husband too shows himself equally a perceptive "pianists' pianist" and a far from reticent chamber music partner - not an accompanist who would be content to have his piano lid on the 'short stick'! Together, they have a great hit with a programme of Miniatures for Violin & Piano arranged by Jascha Heifetz, Arte Nova 74321 72124-2 [review] , played on both instruments with easy, relaxed musicality, subsuming virtuosity but without drawing it to forward attention. We played it straight through with pleasure in the sequence, which is by no means one of mostly 'show off' pieces. Gorgeous! Rapport and balance are notably good there, and equally so on ORF Extraplatte EX 408-2 by Schnittke, Kollontaj, Fheodoroff & Buckinx (with cellist Josef Podhoransky) and in seven works by Jo Sporck on Et'Cetera KTC 1234 (Denisova & Kornienko with a different cellist, Grigori Alumian) This composer portrait CD includes Space 1 (heard in Antwerp), and he is now fixed firmly in my mind as an accomplished and individual Netherlands composer. On her solo CD, Et'Cetera KTC 1236, Elena Denisova gives a fine, fully competitive account of the Bach D minor Partita (with Chaconne) and couples it with a major 35 mins. unaccompanied Partita Testament by Mikhail Kollontaj, which is related to the events of Golgotha in terms of a Russian-Orthodox-Church interpretation. She plays music for violin and organ by Rheinberger on Arte Nova 74321 58965-2, Six pieces Op 150 and Suite Op. 166, unusual novelties. She can be heard as soloist, concertmaster and as leader of the National Quartet of Moscow, with the Collegium Musicum Carinthia, conducted by Alexei Kornienko, as they were at Antwerp, in Hemera HCD 2926, a CD of Musica Concertante from the Trondheim Composers Group by Albertsen, Kleiberg, Bottcher & Bjorklund.